Raspberry Pi, the charitable foundation behind the United Kingdom's best-selling computer, has just unveiled its latest wonder – the Raspberry Pi Zero. Raspberry Pi Zero is a programmable computer that costs just $5 (or £4), may rank as the world's cheapest computer. Get Your Raspberry Pi Zero Now! The Raspberry Pi is responsible for the creation of credit card sized computers, but after years of working to lower the size and cost, founder Eben Upton says the foundation came up with Raspberry Pi Zero that is about the size of a stick of gum and costs just US$5. Upton said the Pi Zero, made in Wales and runs full Raspbian and all your favorite applications including Scratch, Sonic Pi and Minecraft, was as revolutionary as the first Pi. The Raspberry Pi Zero is on sale from today and is also given away with this month’s copy of the Raspberry Pi own magazine MagPi (available at Barnes & Noble and Microcenter). 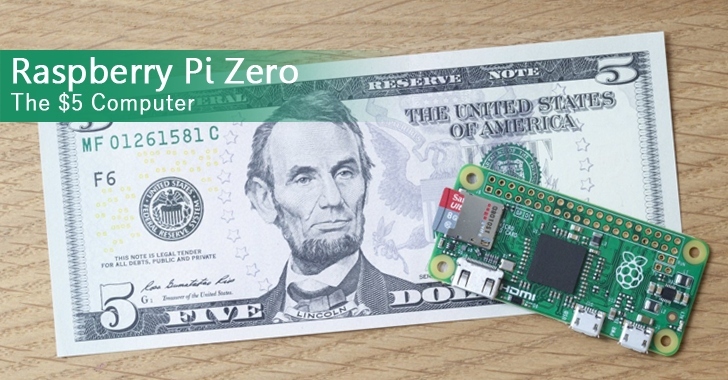 You can order the Pi Zero, which is also available in the UK from element14, The Pi Hut and Pimoronia; in Europe from The Raspberry Pi Swag Store; and in the US from Adafruit and in Micro Center stores. Note: Orders are limited to two per person at launch.